London (AFP) - Arsenal midfielder Jack Wilshere has apologised for his obscene anti-Tottenham chants during his club's FA Cup victory celebrations. 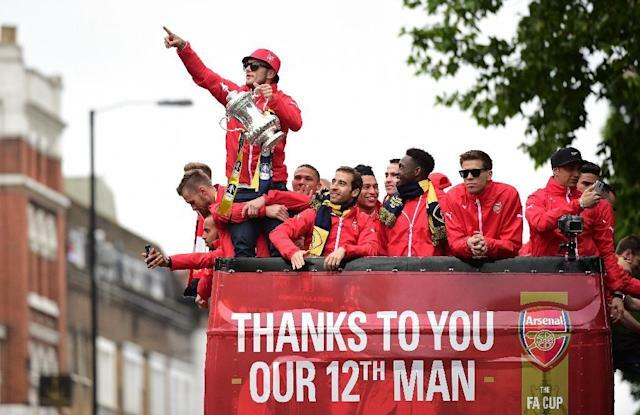 Wilshere took to the microphone on a stage outside the Emirates Stadium on Sunday to mock Gunners' bitter north London rivals as he and his Arsenal team-mates paraded the trophy after Saturday's FA Cup final thrashing of Aston Villa. The 23-year-old proceeded to lead the massed ranks of Arsenal supporters in a chant which included expletives against Tottenham. Wilshere's crude singing drew plenty of criticism, including from former Gunners' striker Niall Quinn who said Wilshere had "overstepped the mark". And the England international on Monday used a Twitter post to apologise to anyone who had been upset by his language. "Sharing back2back Cup wins with so many amazing Gooners is a dream come true. Apologies if I upset or offended any of u with my celebrations," Wilshere wrote. Wilshere is set to join up with England later this week for the June internationals and there is no suggestion at the moment that the Football Association are looking into the matter. Arsenal issued a swift apology during their in-house media broadcast of the event and are understood to have spoken to Wilshere about his conduct.